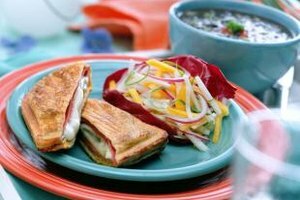 Ham and gouda make for a luscious panini. 4 How Can I Get Brie to the Right Temperature for Serving Quickly? The most famous of Holland’s many specialty cheeses, gouda features a mild flavor that goes well in grilled sandwiches, panini, soup toppings, casseroles and quiches. If you want to pronounce it the way the Dutch do, call it "khow-dah." While aged gouda, complexly flavored and coated in black wax, can be a bit hard for cooking and works well as a lunch or dessert cheese, semi-hard regular gouda -- in yellow wax -- melts beautifully. Keep the gouda in the refrigerator until you are ready to prepare your menu item. Chilled gouda is easier to slice, grate, shred or dice as part of your recipe. Cut the estimated amount of cheese you need from the gouda round and pull the wax coating off. Add gouda cut into ¼-inch dice -- both regular and aged varieties, in a 3-to-1 ratio -- to wine warmed in a fondue pot or slow cooker to make fondue. Stir for 20 minutes over gentle heat to melt the gouda and serve with dipping bread. Like other semi-hard cheeses, gouda only needs mild heat to melt -- and can become stringy if heated at too high a heat. Shred gouda as a part of casseroles such as quiches, combining the cheese with milk, cream and savory additions such as bacon, spinach or sausage. Cook in a 425-degree Fahrenheit oven for around 35 minutes or until a toothpick tested in the filling comes out clean. Slice gouda a quarter-inch thick to make it part of panini, held over a grill until toasted, or even an elegant variation on the grilled-cheese sandwich. Layer the cheese with country ham on country white bread or a French mini-baguette. Melt butter in a pan and cook the sandwiches covered until they are well browned, then flip them over for a shorter cook on the second side. Grate gouda so that it melts as part of a potato gratin. Arrange sliced potatoes in a baking dish and drizzle them with cream. Create three layers of potato, cream and gouda, and bake at 350 F for one hour to allow the top of the gratin to brown. If you use sliced, aged gouda as a topping for French onion soup, keep a close eye on it under the broiler, as it melts and browns generally in under two minutes. How Do I Heat Pastrami Slices for Sandwiches?